Vertical Harvest Hydroponics is online and we are thrilled to be powering their WordPress website! Since their appearance in 2014, the agricultural technology company Vertical Harvest Hydroponics (VHH) sprung into the spotlight due their originality, drive, and noble mission: “to give everyone the ability to grow fresh food.” After witnessing the low quality produce in remote areas, VHH’s founders decided to come up with a solution that would empower residents to grow healthy and sustainable produce year-round. Their answer: shippable and user-friendly hydroponic systems that work from small to large scale, are made in the USA, and, to boot, are created with recycled materials. As huge fans of healthy and local food, the team at Sound Web Solutions has been delighted to be part of VHH’s efforts. With the new features added to their site, VHH can showcase its new products and receive online orders, which is a big step towards their mission of enabling local food production in every corner of Alaska and the Lower 48. We provided VHH with every bit of help we could through the overwhelming process of setting up an online store. We put particular emphasis on making a simple set up that can evolve with VHH’s unique business needs as they grow. The store is easy enough to use that they can update the store in-house, yet powerful enough to work with multiple fulfillment companies, shipping options, and automations to market their consumer hydroponic models. 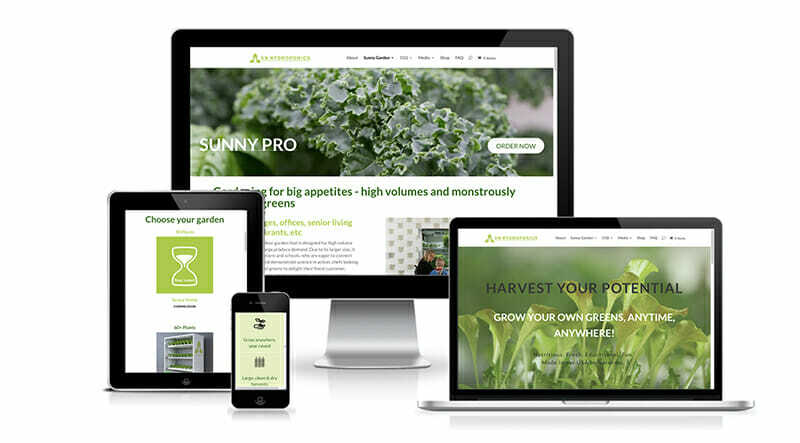 The home page was redesigned to spark interest in hydroponic technology, showcase the company’s newest products, and allow interested customers to easily sign up for email updates. Finally, we crafted flyers to match VHH’s new look, so they can communicate with potential clients more effectively than ever. We look forward to seeing VHH grow in this new phase of business and hope to see more great projects like these come our way. Are you an entrepreneur looking for a custom website to launch your unique ideas to the world? We would love to hear from you.